Midway Alignment of the Bothnian Corridor is an EU-project designed to expand the connections between strong, fast growing, internationally important regions that are in need of a ferry (e.g. Ostrobotnia and Westerbothnia). In other words, the Midway Alignment project will result in a secure, environmentally and economically sustainable transport system for goods and passengers traveling through the Bothnian Corridor. Midway Alignment of the Bothnian Corridor is an EU-project designed to expand the connections between strong, fast growing, internationally important regions that are in need of a ferry (e.g. Ostrobotnia and Westerbothnia). The aim is to improve the transport routes in the Bothnian Corridor and support the existing multimodal TEN-T network, making use of multiple modes of transport (sea, road, railroad). Improved connections also enable economic development, bringing the regions closer to each other and to other regions within the EU. In other words, the Midway Alignment project will result in a secure, environmentally and economically sustainable transport system for goods and passengers traveling through the Bothnian Corridor. Midway Alignment unites many forms of transport. The aim is to create a stable connection between Finland and Sweden, thus generating connections all around the EU. Over the mountains and across the seas transportation is done through cooperation, utilizing logistics in a creative way. The Midway Alignment project will result in a secure, environmentally and economically sustainable transport system for goods and passengers traveling through the Bothnian Corridor. A reliable connection across the Kvarken strait and the Bothnian Corridor boosts trade and cooperation along the expanding multimodal road. Every link in the transport chain has to make the next one stronger in order to keep deliveries quick and stable. The ferry traffic between Vaasa and Umeå, a floating bridge, is still a strategically important link on the E12-road, reaching from Helsinki to Mo i Rana. As the maritime route covers the shortest distance between Finland and Sweden it is also popular for those who wish to trade with Eastern Europe or reach the all-year ice-free Atlantic ports in Norway. New, flexible, environmentally friendly transport routes are needed all around Europe. Therefore Midway Alignment aims to build a modern ship that meets the needs of both passengers and transport companies. New, innovative materials and technologies allow for a light, strong, energy efficient vessel that can run on alternative, environmentally friendly fuel. Did you know that the North is a source of supply for raw materials? A considerable amount of goods (raw materials, paper, building materials) are constantly being exported to the EU markets – briskly and at a low-cost, if possible. To enable this equation, the northerners demand a reliable transport route. Although good alternatives already exist (e.g. the maritime connection between Finland and Sweden), their full potential is not put to use. Midway Alignment means to change that. Operators, cargo owners and the general public all stand to gain! Municipal, regional and national financers from Finland and Sweden, private companies and European Union TEN-T Call funds finance the Midway Alignment of the Bothnian Corridor. Umeå holds a unique position as a dynamic growth region in northern Scandinavia. A strong export industry exists along with a steadily increasing population. Today approximately 118 000 people live in the municipality. Recently, Umeå was highlighted by the EU’s Eurostat office as one of the leading growth cities in Europe. The city offers world-class art, drama, films, industries, music and research. Umeå aims to attract more companies, break new construction records and, not least, become the European Capital of Culture 2014. The growth really sped up in 1965, the same year that the university threw open its doors. Umeå University gives priority to many different areas of research. These include life sciences, human technology interaction, social welfare, ecology and gender perspectives. The university with its 37 000 students works collaboratively with companies such as ABB, Volvo, Skanska and Ericsson. Another center for world class research is the Swedish University of Agricultural Sciences in Umeå. Business growth is occurring primarily in the private sector, both through industrial investments as well as business-oriented services. Rapid growth means a steadily increasing flow of goods to and from the region and that is dependent on a fully developed, intermodal transportation system. To meet these demands, Umeå has invested in a new freight yard and logistics areas, (NLC Park and Terminal) with strategic proximity to the Bothnia Line, the main railway line, E4/E12, the airport, the Port of Umeå and ferry traffic to Finland. The city has the natural conditions to become a transport hub in northern Sweden and for northern Scandinavia and Russia. The City of Vaasa is one of the key growth centres of the future. Relative to its population, it is the largest university city in Finland and boasts 12,000 students studying on six university campuses. Vaasa offers work for all kinds of people. The energy cluster, for example, employs 10,000 people. The city’s self-sufficiency in jobs is the best in Finland. The largest employer in Vaasa is the city itself, employing roughly 6,000 people. The city is also a home to representatives from a hundred different nationalities. Strategically located where the European motorways E4 (north-south) and E12 (east-west) converge. Excellent rail and road connections thanks to its position at the northern end of the Bothnia Line. Sweden’s northernmost container port, with frequent liner traffic to and from the continent and Finland. The last outpost in the Bothnian Sea, with open waters all year round and manageable ice conditions even during harsh winters. Covers a large area of 92 hectares. Prepara­tion is underway for further expansion. A multipurpose terminal which is in increasing use. It handles load carriers for transport by sea, road and rail. An integrated part of the Nordic Logistic Center (NLC) in Umeå. The Port of Vaasa is strategically located in the very vicinity of the leading Nordic business concentration in energy technology. The port handles import and export cargos related mainly to fuel transports, agricultural produce, chemistry, paper industry. It also has the specialized know-how and resources to handle the heavy-duty project cargos of the energy technology and metal industry companies in the region. The Port of Vaasa also provides the world’s northernmost sea-crossing operating all year between two nations. This maritime link, Vaasa-Umea, to Sweden completes the E12 highway, which runs from Russia all the way to the Atlantic coast of Norway. The Kvarken Council is a Nordic cross border cooperation association for the Ostrobothnian counties in Finland as well as Västerbotten and Örnsköldsvik in Sweden. The Kvarken Council was founded in 1972 and is one of the official Nordic cross border bodies, which are co-funded by the Nordic Council of Ministers. Welcome to Wasaline! We take you across the Gulf of Bothnia every Day in only 4 hours. M/s Wasa Express provides a shortcut between the cities of Vaasa and Umeå, which saves hundreds of kilometers by car. M/s Wasa Express offers excellent conference facilities and our group and conference booking will help you with all the arrangements needed. Welcome aboard! Through Region Västerbotten, the county’s 15 municipalities and Västerbotten County Council take clear political responsibility for development in Västerbotten County. This includes for example modern, sustainable communications and good social services that transcend municipal and administrative boundaries. Region Västerbotten also promotes business and commerce. A statutory joint municipal authority which strives to build up the necessary conditions for balanced development and economic growth. Responsible for regional and spatial planning in Ostrobothnia and deeply involved in promoting and developing cross-border transport networks. We are a leading producer of high-strength steel and have a capacity for producing six billion tons of crude steel. Our goal is to increase our sales of high strength steel so they make up half of our sales by 2015. At SSAB, we work towards a stronger, lighter and more sustainable world. By working closely with our customers we find solutions that will solve their challenges while making their business more profitable and environmentally friendly. That means that we need to take the lead in our field and develop steel solutions that are at the very forefront of technology. Komatsu Forest is an international group with its headquarters and technology center in Umeå, Sweden. Komatsu Forest produces the Komatsu brand of forest machines and is one of the world’s largest manufacturers in this sector. Komatsu Forest has some 1,400 employees and is represented in all markets where mechanized forestry is used. The company has two manufacturing units, one in Sweden and one in the US. Komatsu Forest has customers all over the world, served by own sale companies or dealers in Europe, North America, South America, Africa, Oceania and Asia. Komatsu Forest AB is owned by the Japanese company Komatsu Ltd.
ABB is a leader in power and automation technologies. ABB marine solutions secure reliable, safe and environmentally-friendly shipping. The spearhead products include Azipod® propulsion system, EMMA energy management system and shore-to-ship equipment for connecting vessels to onshore power. The leading classification society, with a 24% share of the world’s classed ships and mobile offshore units, DNV GL Maritime supports a safe and sustainable future for the maritime industry. Technology Centre Oy Merinova Ab promotes utilisation of new technologies and the growth of companies by, together with its partners, offering development services especially for companies in the energy technology sector. Merinova is, in co-operation with its associated company Oy Vaasa Parks Ab, responsible for the technology centre services in the Vaasa region. Volvo is one of the world´s leading manufacturer of heavy duty trucks. Volvo Trucks, Umeå, is the main producer of cabs for Volvo Trucks and one of the largest manufacturing site in northern Sweden with 2000 employee. SCA Logistics provides an extensive sea and land transport service within Europe and other overseas destinations. The business is supported by a network of terminals at strategic locations in Europe. SCA Logistics is part of SCA’s Forest Products business unit, which produces paper for packaging and print, pulp, solid-wood products and renewable energy. SCA Forest Products also manages SCA’s extensive forest holding, supplies SCA’s Swedish industries with wood raw materials, in addition to offering cost-efficient transport solutions. These are projects that we would like to spread the word about. The project looks at overcoming the existing barriers to establish an LNG bunkering supply chain in the Mediterranean basin of Spain. The transition towards an LNG bunkering supply network requires a doubleaxis action. On one side, the existing and future maritime fleet needs to be adapted in terms of technology of ngines and storage. On the other, terminals and other facilities at ports need to be upgraded or developed in order to deploy a full supply chain providing enough security of supply. All you ever wanted to know – and more! Why is the transport connection between Vaasa and Umeå so significant? 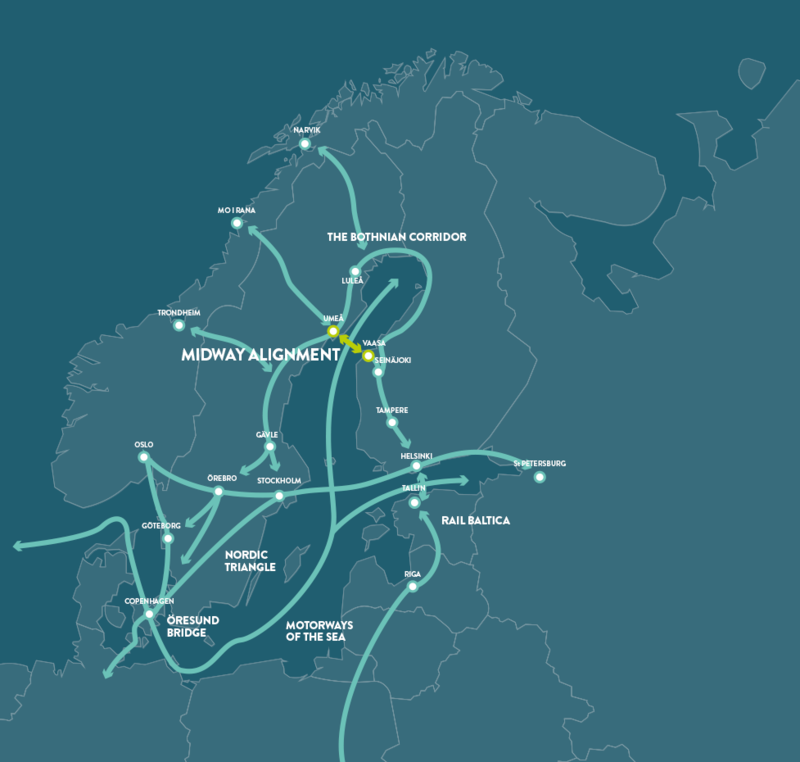 Midway Alignment of the Bothnian Corridor is an EU-project designed to expand the connections between strong, fast growing, internationally important regions that ensure bustling ferry traffic (e.g. Ostrobotnia and Westerbothnia). The aim is to improve the transport routes in the Bothnian Corridor and support the existing multimodal TEN-T network, making use of multiple modes of transport (sea, road, railroad). Improved connections also enable economic development, bringing the regions closer to each other and to other regions within the EU. In other words, the Midway Alignment project will result in a secure, environmentally and economically sustainable transport system for goods and passengers traveling through the Bothnian Corridor. What will the project do in practice? What are the project’s benefits? Although good transport alternatives already exist (e.g. the maritime connection between Finland and Sweden), their full potential is not put to use. Midway Alignment means to change that. When transport companies use ships and/or trains instead of driving around the Gulf of Bothnia, they save fuel, time and kilometres. The shift from road to sea and rail involves interconnecting two national rail networks and bypassing more than 800 km of existing road routes. Besides the obvious environmental benefits it has positive effects on safety, service quality and transport costs. Moreover a reliable connection across the Kvarken strait and the Bothnian Corridor boosts trade and cooperation along the expanding multimodal road. Every link in the transport chain has to make the next one stronger in order to keep deliveries quick and stable. Midway Alignment aims to build a modern ship that meets the needs of both passengers and transport companies. New, innovative materials and technologies allow for a light, strong, energy efficient vessel that can run on alternative, environmentally friendly fuel. What is the project’s timetable? The Budget for phase 1 is MEUR 20.7. Municipal, regional and national financers from Finland and Sweden, Private companies and European Union TEN-T Call funds finance the Midway Alignment project. The European Commission has adopted a proposal to transform existing patchwork of European roads, railways, airports and canals into a unified transport network (TEN-T). The new core network will remove bottlenecks, upgrade infrastructure and streamline cross border transport operations for passengers and businesses throughout the EU. It will improve connections between different modes of transport and contribute to the EUs climate change objectives.